Happy Squirrel Arts "Something Wild" Fall Day Camp — CascadiaNow! 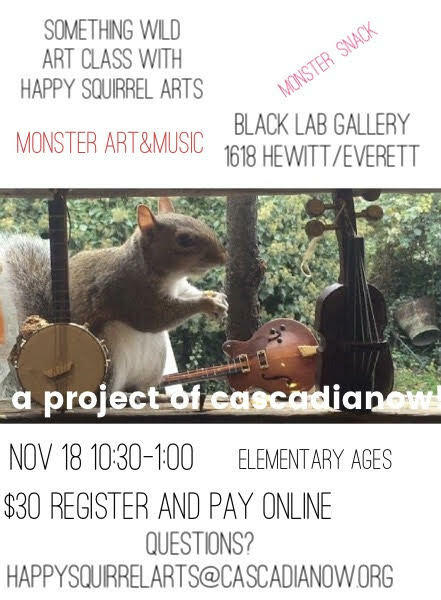 Happy Squirrel Arts, a project of CascadiaNow!, presents "Something Wild." At this fall day camp, elementary age kids will design and hand sew monster hats and make monster hands from gloves. The day will feature art and kid snacks plus monster songs and singing games. Moms and Dads can come kick back with mimosas or coffee while Happy Squirrel Arts sings and creates art with kids! $30 per student. Help make this and other Happy Squirrel Arts camps accessible to all: support this project with a donation! All gifts are tax deductible. Contact us to let us know if you would like to volunteer directly with this project.